My mantra: buy what you love but be patient. If you're anything like me, you're loving something new every day. 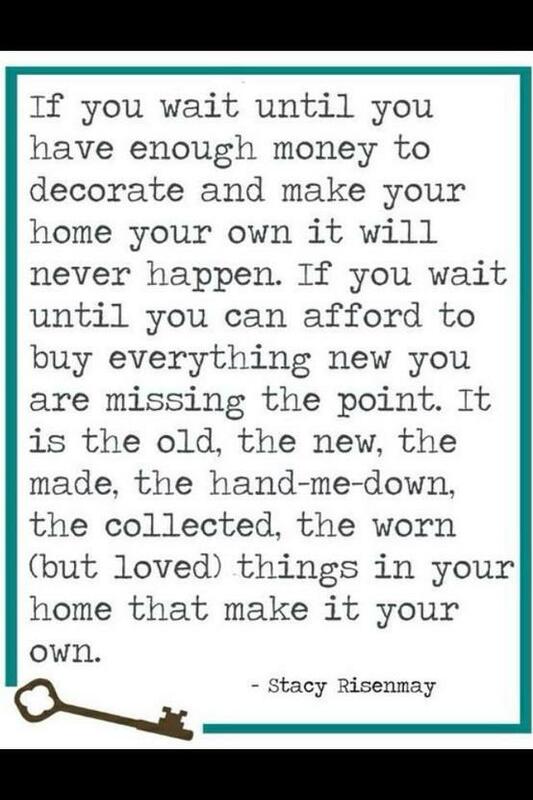 I'd be in the poor house if I bought everything I loved. So be picky. Don't settle. BE PATIENT. Don't expect to furnish/decorate your living room in one shopping trip. It's the things that you collect over time that make your house uniquely yours. (I have things that I've saved since childhood currently in my home and guess what? I still love them!) And lastly, HAVE FUN with it. If YOU love it, go for it. It doesn't matter if it's not "in", or maybe it's overly "in" and everyone has a orange couch in their family room (ya never know). If you love it, it'll work. Enjoy the hunt, friends. Now go forth, score some deals, find some amazing treasures and make me proud. Love that philosophy! Me too. ;) I don't want my house filled with "mass produced" items. I love to be able to look around my rooms and know where I found every trinket. It reminds me of that day (scoring the perfect find) or a trip, etc. Yep Yep. Have you seen the new issue of Country Living? The editor's little page is pretty much this. You are a genius and should be a magazine editor.